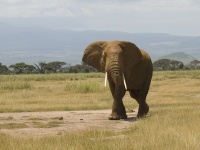 Amboseli is a park of giants, renowned for its herds of mighty tusked elephants presided over by the magnificent backdrop of Africa's highest mountain, Mt Kilimanjaro. One of Africa's most unforgettable images is the picture of these large creatures standing in silent tribute before the gigantic snow-covered mountain just over the border in neighbouring Tanzania. It is a relatively small park with wide plains merging with the distant skyline, affording good visibility in all directions. Observation Hill rises from the centre for breathtaking views over the park and towards Mt Kilimanjaro, especially in the pink light of dawn. Meaning 'Place of Water' in the Masai language, it has a continuous supply from Kilimanjaro's snowmelt, forming underground springs that feed the marshy patches and swamps home to hippos and a great variety of bird life. Predators are relatively scarce apart from jackal and hyena, but there are large numbers of grazers such as wildebeest, zebra and gazelles on the grassy plains and giraffe among the thorn trees. A popular way to take in the scenery is by way of a noiseless microlight flight, either from Nairobi or the Amboseli airstrip. There is a wide range of accommodation in and around the outskirts of the park for those wanting to extend the experience.